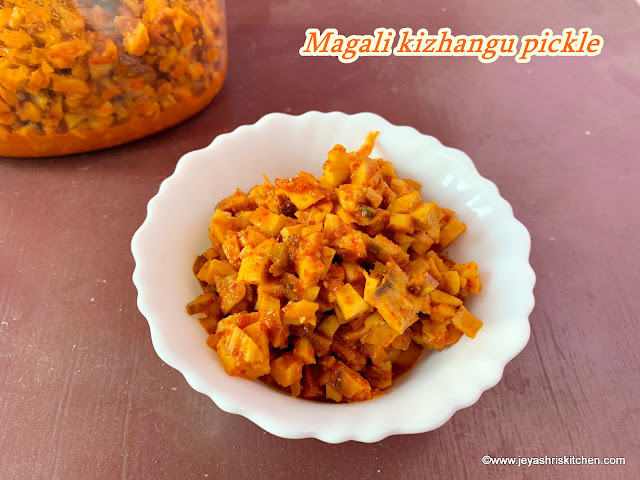 Magali kizhangu urgaai| mahali kizhangu pickle, is a popular tamil brahmin style, zero oil pickle recipe. The Mahali root has lots of health benefits, mainly it helps in purification of blood. When it comes to the taste of the pickle, it has 2 extremes, either people will love it the most or hate to the core. Many don't like even the smell of the magali root. But for the magali pickle lovers it's a heavenly combo with curd rice. Generally curd is added to this pickle and popularly known as Magali thayir oorugai. Though i don't like this magali pickle(yes 😉) i wanted to document this heirloom recipe in jeyashri's kitchen. My brother in law got this magali kizhangu from West mambalam station road, Chennai. This Magali pickle recipe comes with an amature video of my mom telling how to make the magali pickle. I was insisting her to tell her on the same day we made the pickle but she was too much tied with other chores and was reluctant to stand for a video. Also i stayed in her place for a day only. Yesterday my sister sent me this video, took from her mobile. Even the step by step pictures are taken by me using mobile as i didn't take my camera during this vacation. Stay tuned to more pickle recipes coming up in Jeyashri's kitchen. 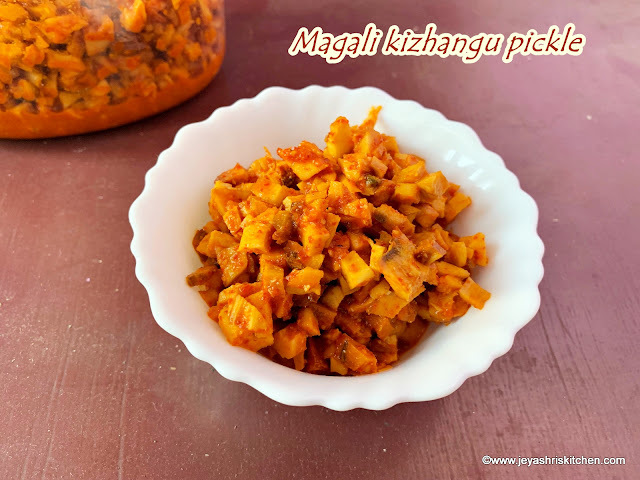 Description: Magali kizhangu urgaai| mahali kizhangu pickle, is a popular tamil brahmin style, zero oil pickle recipe. *We missed to add while grinding. Wash the magali kizhangu nicely and take out the skin using a peeler. Wash it nicely, mahali kizhagu has lots of dirt so wash it completely. Slit the kizhangu in the center and take out the vein like thing( a stick kind of) in the center. The kizhangu is not too hard to cut, it is ok to handle with a knife. Take out the stick like thing in the center. Do it for all the kizhangus. Finely chop the magali kizhangu. Wash it again nicely and drain the water completely. Grind the red chillies, salt and mustard seeds ( we missed to add the mustard seeds) into a fine paste. In a wide bowl add the chopped magali pieces. Add the ground chili paste to this. Squeeze the lemon juice. Discard the seeds before squeezing. Mix well using a clean dry spoon. Store this in a clean dry jar. Everyday morning mix the jar well. Ensure the hands are not dirty and wet. Just a nice mix without touching the pickle will do. After 3 days the kizhangu will become soft and it is ready for consumption. Just before serving the pickle add thick yogurt and mix well. Serve with curd rice. Generally curd is added to the entire pickle but amma always adds in batches as and when she consumes it. She always says that adding in bulk makes the pickle very sour. I couldn't take the picture of the pickle with curd as amma didn't allow me to add before the entire pickle gets marinated. 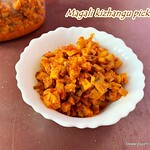 Magali kizhangu pickle goes well with curd rice and also with sambar sadam too.